I am remiss for not having posted an entry here in so long. The fact of my finally finishing up the first true serif text-type family I’ve ever made is no good excuse (unlike, perhaps, my propensity to enter The Type Design Zone and not emerge for weeks at a time). Anyway, apologies. But I have something to share today that I hope will make up for the delay: a dive deep into the quirks and peculiarities of 19th-century penmanship—or at least one man’s peculiar, quirky penmanship—that should give you an idea of how to go about deciphering old handwriting. Or at least how I do it. 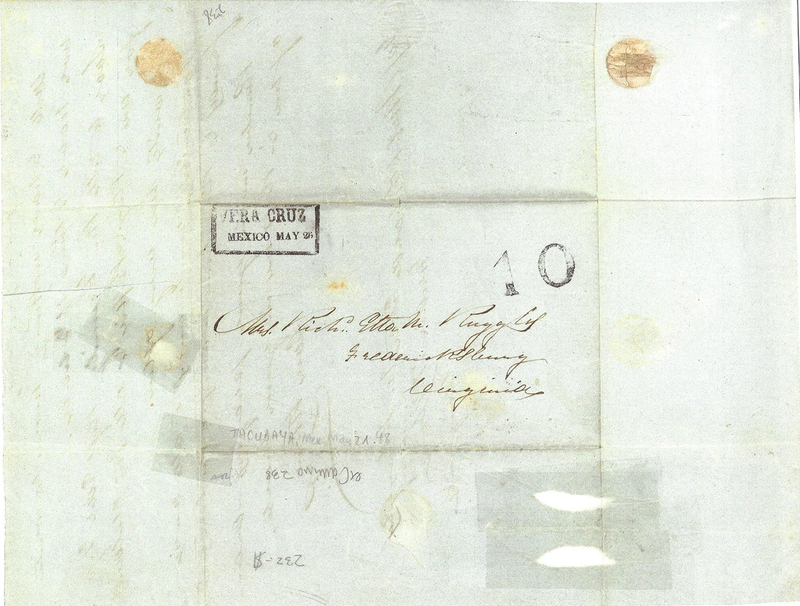 Address page of the Ruggles letter. 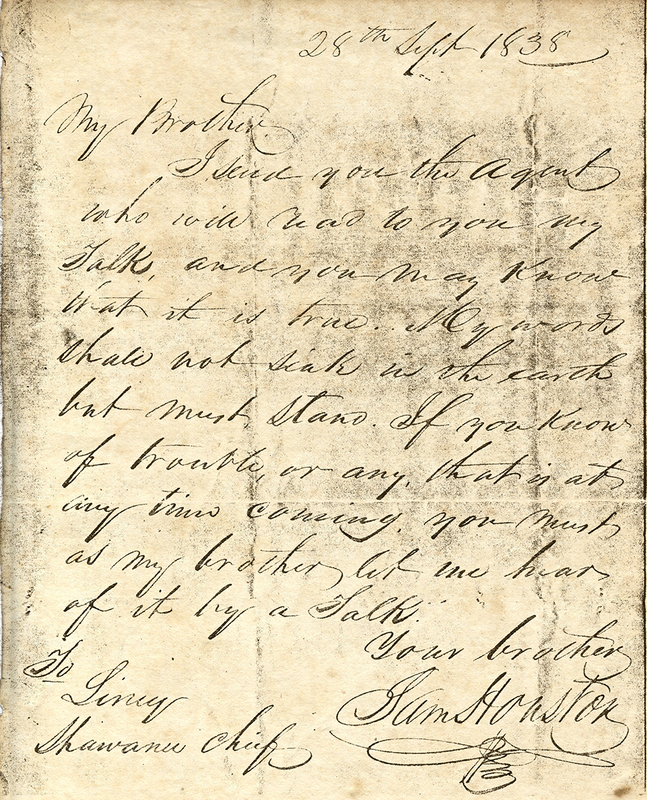 The penmanship in question appears in a digital scan of a three-page letter (see below) sent to me by an acquaintance who has an enviable collection of historical records and documents from the days of the Republic of Texas. I’d transcribed a handwritten narrative for him already, one whose puzzles were mostly problematic words and short phrases. But this new letter—despite its bold and graceful pen strokes—caught me off guard for its first-blush illegibility. I’ve had plenty of trouble deciphering old handwriting, but at first glance I can usually get a fairly good idea of who had written a thing, or what was being written about. The scan of this letter, with its alluring greenish tinge, seemed more or less inscrutable. Eventually, though, I managed to puzzle out every word. Here’s how. Another puzzle. Was this a woman named Ella who was married to a man named Richard Ruggles? At least by now I had determined that the writer’s lowercase “a” looked like an “o” followed by an extra “i”-like stroke. And that the “d” had a very short ascender. After staring for a while I noticed a seemingly random horizontal stroke that told me her name likely wasn’t Ella after all—but Etta. I took a peek at the last page of the letter, which the author had stylishly signed with the just his initials, “D.R.” So if this was a husband in Mexico writing a wife back in Virginia, his given name was clearly not Richard. I pored for a while over the salutation, which—now that I could identify a few odd-shaped letters—I managed finally to work out: “My dearest Etta.” (I was now confident that was her name, from the way the cross of the “t” in “dearest” nearly missed the letter altogether, as did the cross of the double-“t” in Etta.) I soon also had the first paragraph deciphered. Not that it held a lot of clues. Further on I could read a few words and phrases, among them “prospect of peace,” “treaty,” “the 19th inst. Friday,” and what appeared to be the phrase “Chamber of Deputies.” I saw that the author made peculiar “r”s that had a sort of extra squiggle at the end, figured out that those tiny, two-line shapes were ampersands, grew accustomed to his open, unusual “I”s—and realized he was likely in Mexico because of war. It was time to poke around online. By searching for “Mexico,” “war,” and “1848,” I confirmed that the Mexican-American War ended in that year. A treaty was signed in February, but U.S. troops didn’t entirely evacuate until August. So I searched for “Ruggles” and “Mexican-American War”—and first on the list of results was a Wikipedia entry for Daniel Ruggles (1810–1897), a Brigadier General for the Confederacy in the American Civil War. 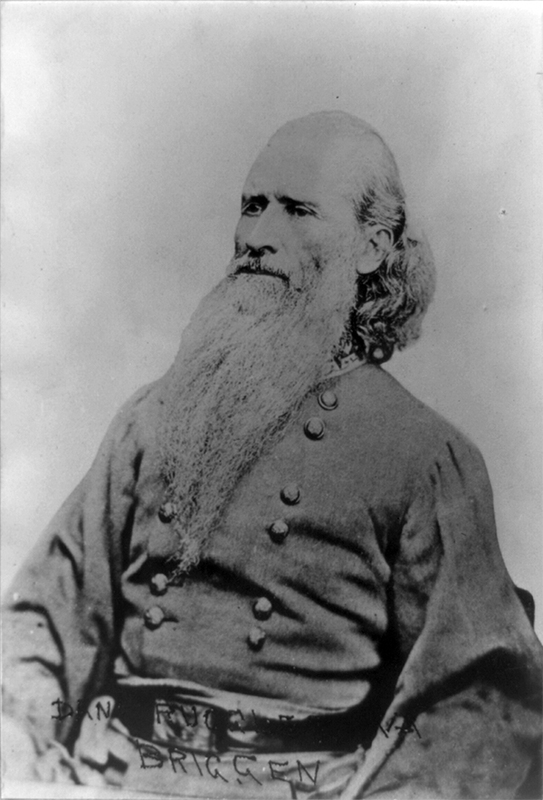 I learned that, before that war, U.S. Lt. Col. Ruggles had served in the Texas Campaign, and later, after a long life, had died in Fredericksburg, Virginia. A search for “Daniel Ruggles” and “Richard Etta” got me genealogical records showing that Richard Etta (or “Richardetta”) was in fact the wife of Daniel Ruggles. I learned that Etta’s maiden name was Hooe, that her middle initial stood for Mason, that she and Daniel were married in Michigan in 1841, and that she died in 1904. I even got a look at the the Ruggleses’ headstone in Virginia. Armed with this additional background info (which helped also with the seemingly incongruous mention of “Saut on Ste Marie”) and a sense of context, I set to work transcribing Daniel Ruggles’s letter home to his wife, Richardetta. It took nearly two hours, but I got it done. Deciphering old penmanship can be a puzzle, for sure, but a puzzle that—thanks, ironically, to the digital technology that might ultimately doom handwriting altogether—often promises a circuitous journey through interesting times gone by. 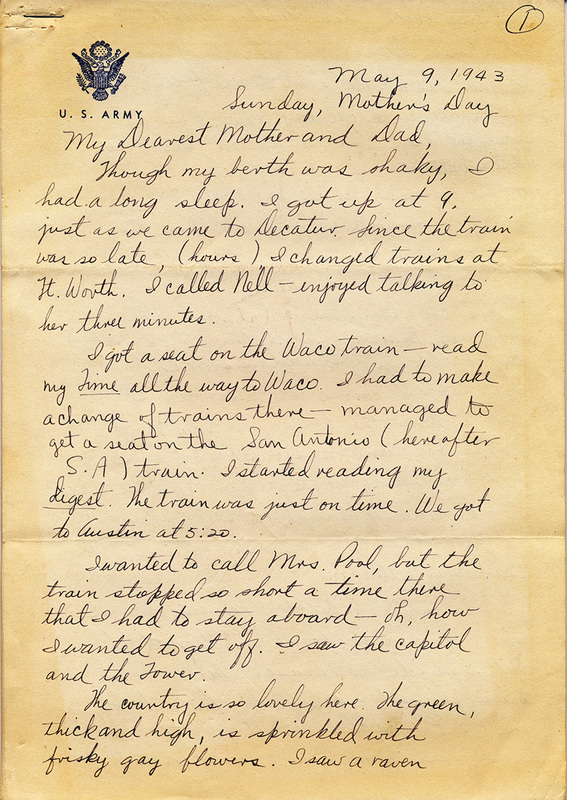 Below are the scans of the three pages of Ruggles’s letter, each followed by my transcription of that page. (Click any page image for a larger view.) I hope and expect you’ll find its contents surprising and fascinating. 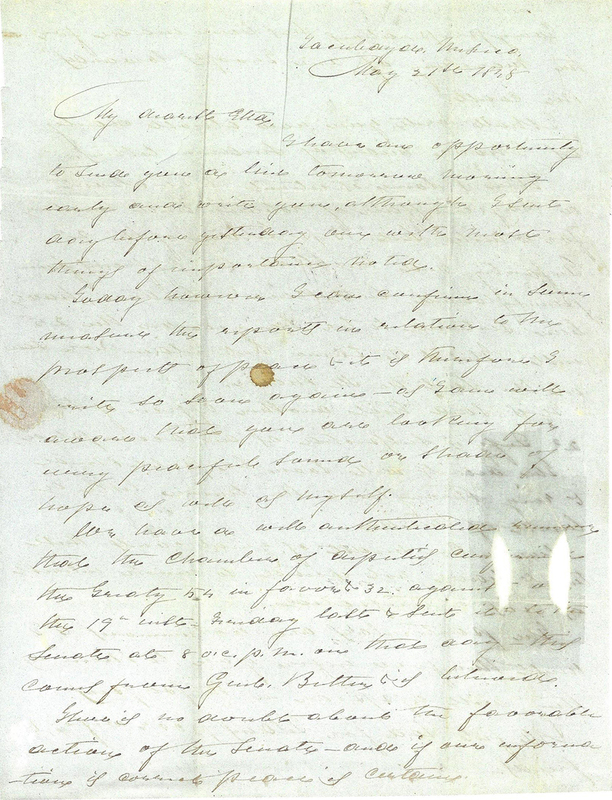 The Ruggles Letter, page 1. I have an opportunity to send you a line tomorrow morning early and write you, although I sent day before yesterday one with most things of importance noted. Today however I can confirm in some measure this report in relation to the prospects of peace & it is therefore I write so soon again— as I am well aware that you are looking for every peaceful sound or show of hope as well as myself. We have a well authenticated rumour that the Chamber of Deputies confirmed the Treaty 54 in favor to 32 against on the 19th inst. Friday last & sent it to the Senate at 8 o.c. p.m. on that day—this comes from Genl. Butler & is believable. There is no doubt about the favorable actions of the Senate—and if our information is correct peace is certain. 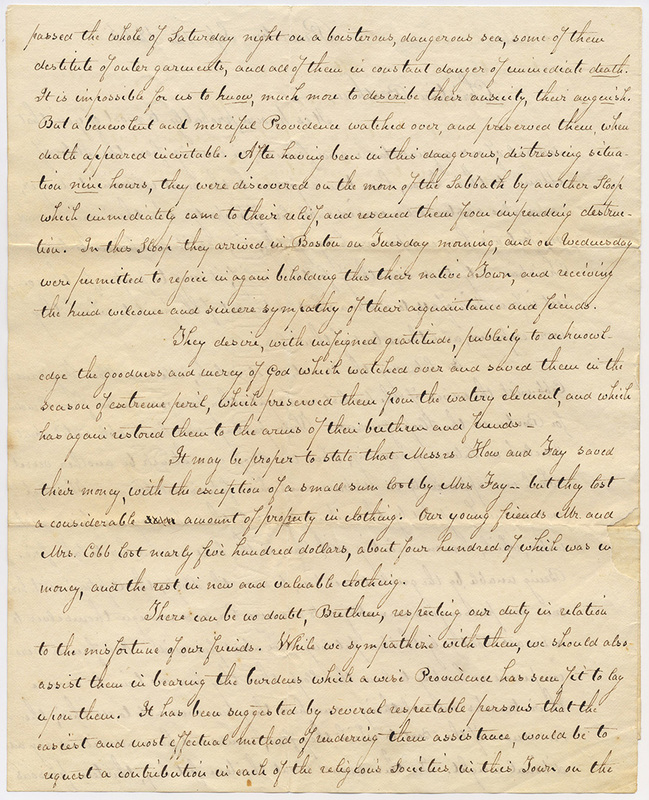 The Ruggles Letter, page 2. Every preparation has been made for the marching of our Troops towards the coast. I shall write you now almost daily as I have means of sending letters. There is some excitement here about a tragic affair of robbery and murder for which Lieut. B. P. Tilden of the 2d Infantry and two volunteer officers from Pennsylvania. Lieuts. Hare & Dutton, have been sentenced to be hanged on the 25th inst. This is the same Lieut. Tilden we saw at the Saut on Ste Marie. It is said that another officer of the 2d Infy is suspected as an accomplice. The details will soon be published & ring throughout the Union like a bolt of thunder. Here in the midst of great events these trials have not excited so much interest as was anticipated. The particulars are voluminous & I must therefore refer you to News as they will appear in the papers. All feel sad for Tildens poor wife, & friends. 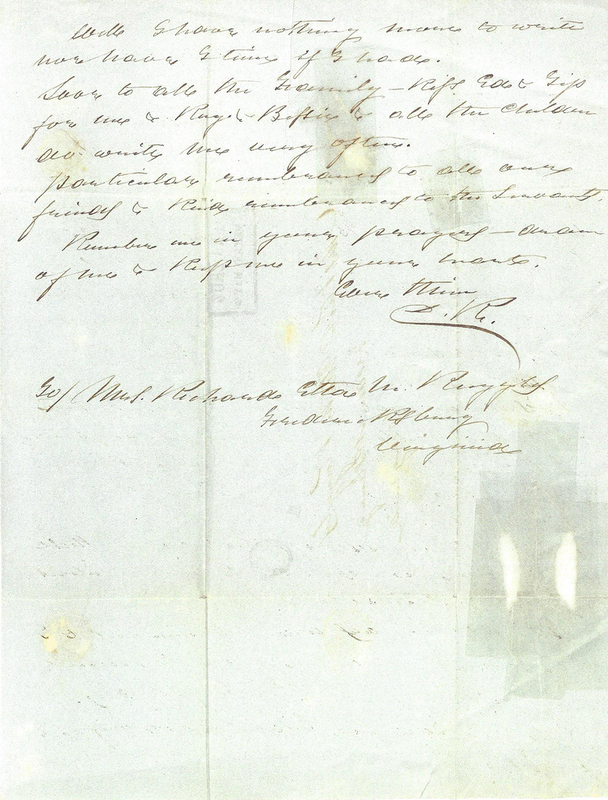 The Ruggles Letter, page 3. Well I have nothing more to write nor have I time if I had. Love to all the Family—kiſs Ed & Tip for me & Roy & Beſsie & all the children do write me very often. Particular remembrances to all our friends & kind remembrances to the Servants. Remember me in your prayers—dream of me & kiſs me in your heart. » Turns out 400-year-old handwriting is even trickier to read—and can result in surprises. 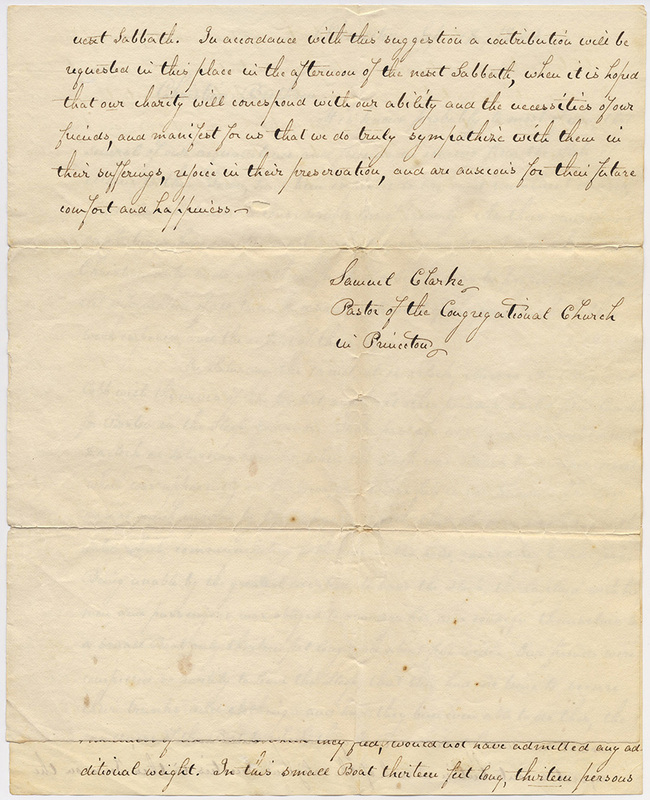 » Speaking of transcriptions, Norfolk County, Mass., has digitized 250,000 old deeds—including a few historic ones. » For its 500th anniversary, The Royal Mail is urging UK residents to dig out old handwritten correspondence. 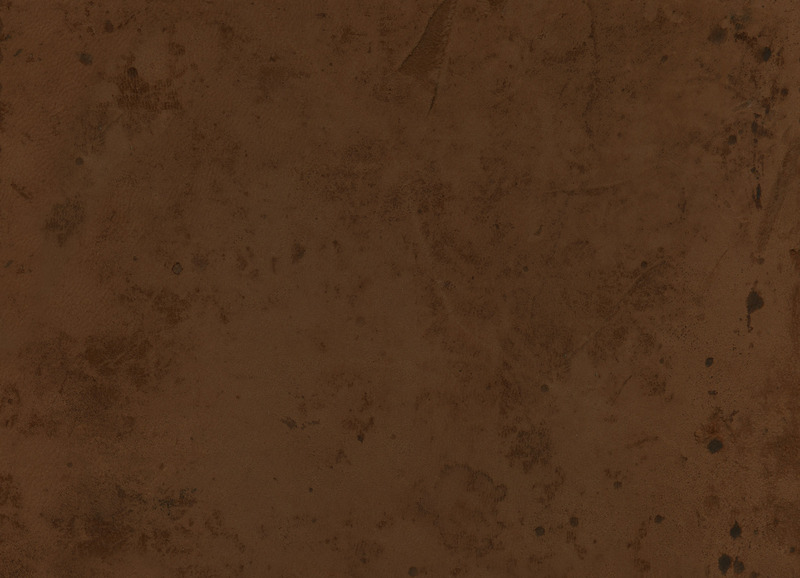 » Going back way farther: handwriting from 600 B.C. suggests widespread literacy—and an older Old Testament. » And although it might be delaying the inevitable—the teaching of cursive penmanship ain’t dead just yet. 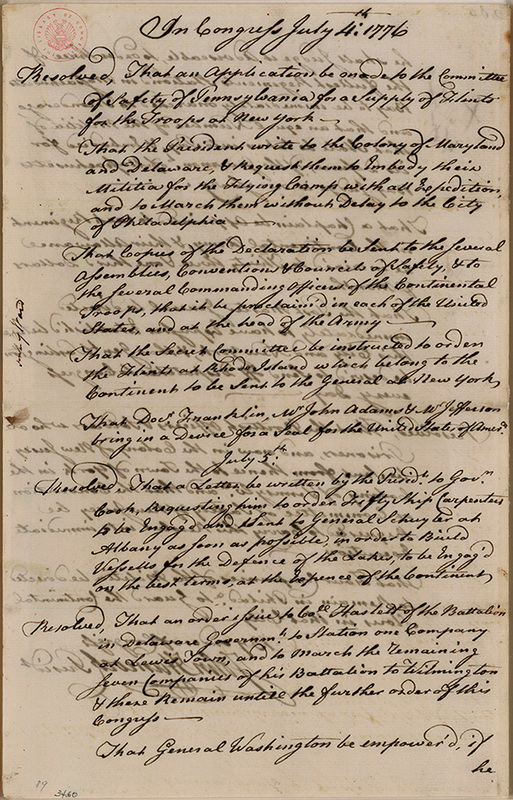 The Palmer Method of cursive script. A few days ago I listened to a fascinating Freakonomics Radio podcast called Who Needs Handwriting? In exploring the question of its title, the episode features an interview with Anne Trubek (@atrubek on Twitter), a writer, editor, and former professor who knows a lot about writing by hand. Trubek, who is author of the forthcoming The History and Uncertain Future of Handwriting, essentially argues that kids don’t need to learn penmanship anymore. It all started, Trubek says, when her son began having problems in second grade—strictly because of his poor handwriting skills. So she wrote an article for Good magazine with the bold and declarative title Stop Teaching Handwriting. It drew a lot of interest. 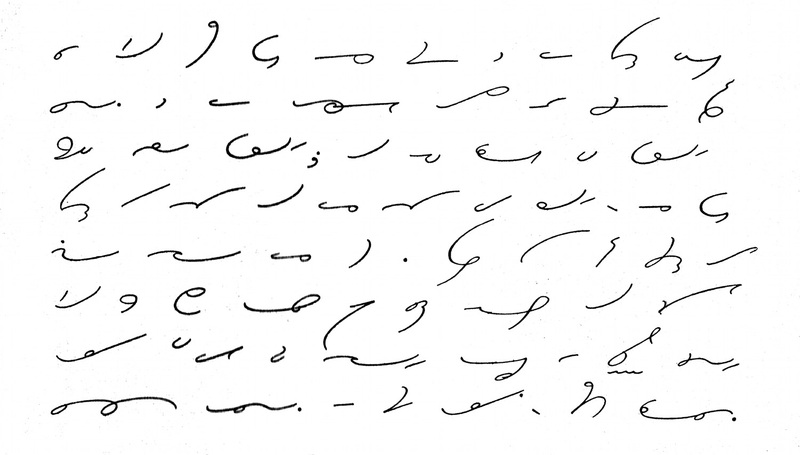 The Gregg Method of shorthand. And she has a point: young people of today might well go far in our technology-driven world without so much as ever touching a pen. What use is it for us to continue to embrace what was originally a strictly utilitarian skill out of some romantic sense of self, a part of our individuality? Then again, the Freakonomics podcast goes on to tell us, research shows that students who take notes by hand recall a lot more of a lecture than those who merely transcribe what’s said via keyboard. So should we perhaps be reviving shorthand (a skill my father practiced, much to my childhood incredulity and awe)? Not so much, turns out—it’s a lot closer to straight keyboarding. Still and all, cursive script appears to be on the way out—other than as a fine art form. Fewer people over time will be able to read engrossed old documents. Who among us these days, after all, can interpret the early hand-scribblings of, say, a Sumerian skilled at cuneiform? Rev Robert J Palladino (at Reed College). On the other end of the handwriting spectrum, you have a celebrated scribe like Rev. Robert J. Palladino, who died a couple weeks ago. Palladino was a Trappist monk when he began learning the skills that made him a master calligrapher who, at Reed College, influenced Apple co-founder Steve Jobs’s design of the Macintosh computer. 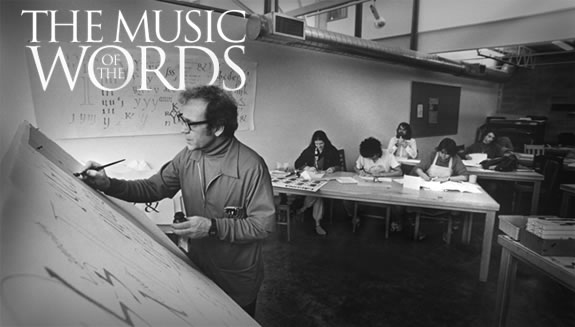 Jobs credited a Palladino calligraphy course he audited with helping inspire the whole idea of digital typography. In a delicious twist of irony, of course, a master with a pen helped further our mass migration over to the keyboard. But there’s something to be said for Father Palladino’s own unwired life—replete with its long periods of thoughtful silence—and his having never once used a computer in 83 years. 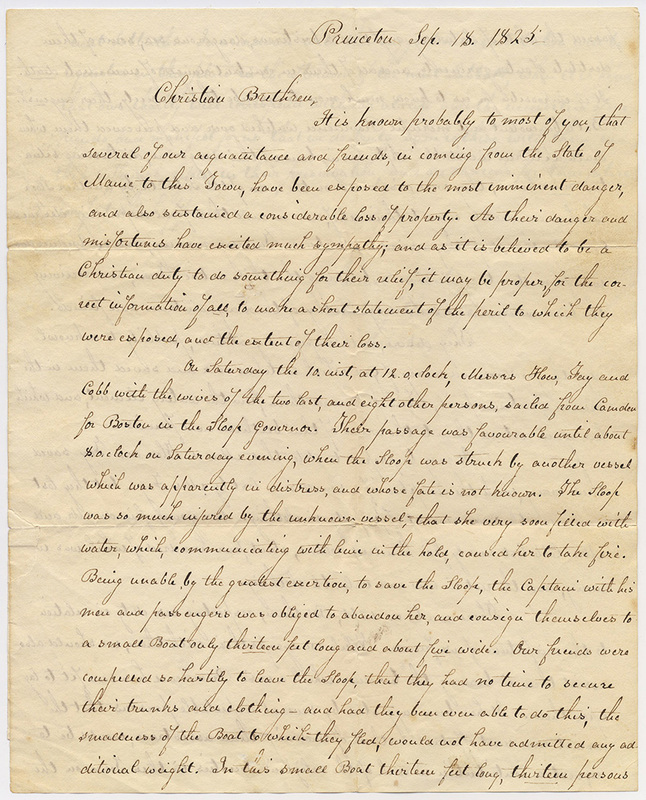 The Schooner Script letter, page 1. It is known probably to most of you, that several of our acquaintance and friends, in coming from the State of Maine to this Town, have been exposed to the most imminent danger, and also sustained a considerable loss of property. As their danger and misfortunes have excited much sympathy; and as it is believed to be a Christian duty to do something for their relief, it may be proper, for the correct information of all, to make a short statement of the peril to which they were exposed, and the extent of their loss. The Schooner Script letter, page 2.
passed the whole of Saturday night on a boisterous, dangerous sea, some of them destitute of outer garments, and all of them in constant danger of immediate death. It is impossible for us to know, much more to describe their anxiety, their anguish. But a benevolent and merciful Providence watched over, and preserved them, when death appeared inevitable. After having been in this dangerous, distressing situation nine hours, they were discovered on the morn of the Sabbath by another Sloop which immediately came to their relief, and rescued them from impending destruction. In this Sloop they arrived in Boston on Tuesday morning, and on Wednesday were permitted to rejoice in again beholding this their native Town, and receiving the kind welcome and sincere sympathy of their acquaintance and friends. It may be proper to state that Messrs How and Fay saved their money, with the exception of a small sum lost by Mrs. Fay—but they lost a considerable amount of property in clothing. Our young friends Mr. and Mrs. Cobb lost nearly five hundred dollars, about four hundred of which was in money, and the rest in new and valuable clothing. 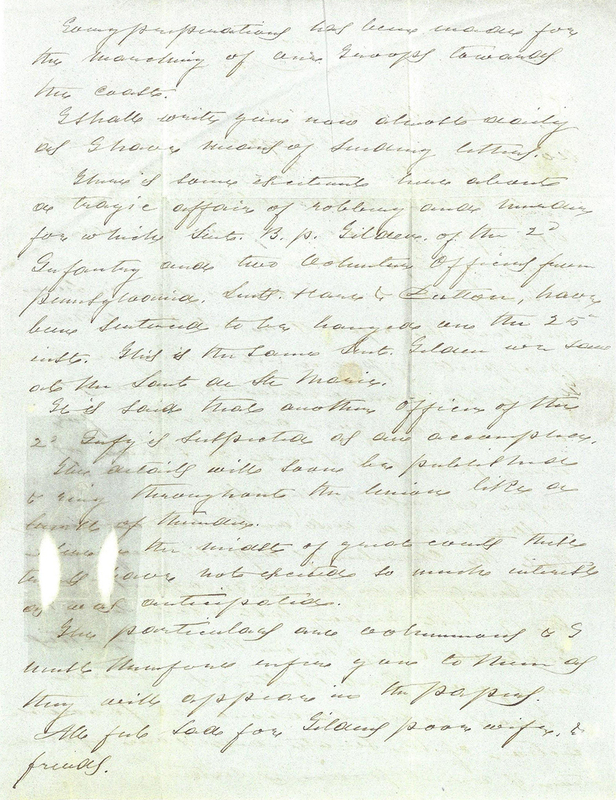 The Schooner Script letter, page 3. » Lamentations continue over the decline of cursive—from pen companies, forensic scientists, and autograph collectors. » Does playing with old-fashioned toys help kids learn better handwriting skills? » Handwriting analysts go to town on a note left by a guy who found a wallet full of stuff—but didn’t return it all. » It might be fading generally, but certain local school districts continue to find time for handwriting instruction. » A thoughtful essay by Dolly Merritt about what penmanship used to mean. Today, here in the U. S. of A., some celebrate National Handwriting Day. 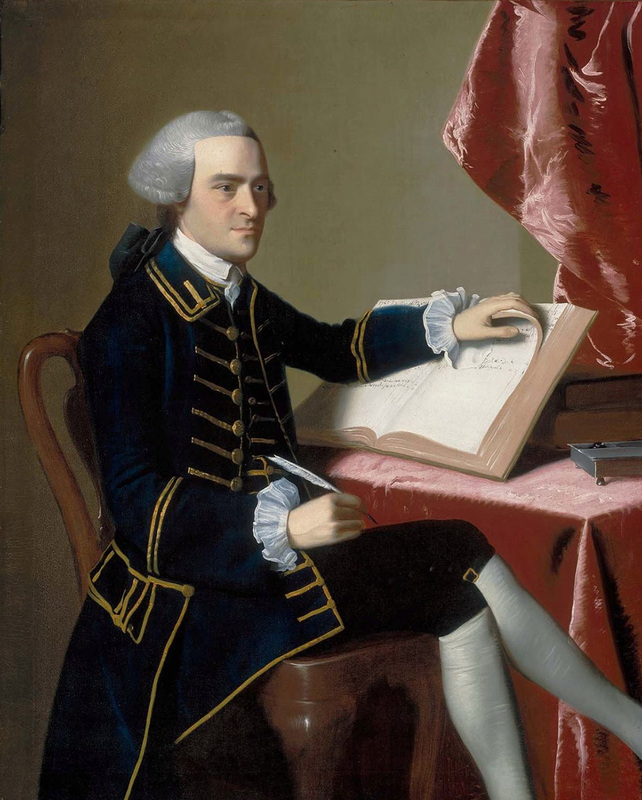 The first National Handwriting Day happened in 1977, thanks to some folks with a stake in the practice—the Writing Instrument Manufacturers Association—who decided to celebrate penmanship on the 240th birthday of John Hancock, famed signatory of the Declaration of Independence. Not a bad idea. In the four decades since, of course, a plethora of keyboards and smartphones and tablets has rendered penmanship more of a hobbyist’s pursuit. Not unlike taking pictures with now-old-fashioned film cameras. People don’t practice it, schools don’t teach it, and kids wouldn’t know how to decipher cursive script if their lives depended on it. Never mind that it’s actually good for you. Even yours truly, who has black ballpoints scattered handily around the house on nearly every desk and table, rarely writes more than to-do lists these days. Some Antique Penman I am. And guess what? It turns out laments over the lost art of handwriting are nothing new. As a TIME article yesterday by Lily Rothman points out, teachers of penmanship deplored the death of fine pen strokes way back in 1935, more than forty years before the first National Handwriting Day. The trend toward bad handwriting also made the news in 1947, again in the early ’50s, and throughout the ’60s and ’70s. But most of that 20th century hue and cry came over the death of good handwriting—not the extinction of any kind of handwriting at all. As I’ve opined here before, it’s not the beauty of the script that most counts—it’s its far less critical, less tangible qualities. Its heaviness or airiness, its intricacy or loopiness or slant. What it says about the writer. Its familiarity to someone. While we’re not aware of scientific evidence supporting the warm feeling of receiving a handwritten thank you card or love letter, anecdotal evidence suggests there’s something there. Now, see, this is what I’m talking about. Think of the subtle, complex, even visceral effect you get when first viewing a note card or sheet of stationery that someone far away has held, and has written on, has strung together words that communicate sentiments meant only and particularly for you. Think also of the secret knowledge on the part of the note- or letter-writer of how what they write will affect their distant pen pal. Think, too—maybe especially, in this word of instant communication—of the span of time between the writing and the reading. In a piece today for International Business Times, William Watkinson lists a few examples of what handwriting says about a person: heavy vs. light pressure, the shapes and sizes of letters, their wide or narrow spacing. In the process of developing my historical pen fonts, I’ve read so many letters of well-known historical figures that I’ve seen a lot of these graphological clues—e.g., the large, airy penmanship of Sam Houston, the fancy script of Mirabeau B. Lamar, the scrawl of Emily Austin Perry. I’ve studied ink blots and cross-outs and what I’m convinced are the marks of tear drops. But what I cannot do is divine how it felt for the recipients of these missives to read their authors’ handwritten words. Recipients like Shawnee Chief John Linney. Or the husband of Emily Perry. There’s a distinct difference between reading a novel on a tablet screen and reading a perfect-bound book. I’d argue there’s even a greater difference between reading a handwritten note left hours or days before and an email message sent thirty seconds ago. A difference—a warm feeling—that’s akin to magic. » Um, contrariwise, here’s a robotic handwriting service—which is not exactly what I’m talking about. » Australian parents emphasize handwriting—and so do Australian schools. » Another group of champions of cursive script? Historical reenactors. » A century-old box in the cornerstone of a Kansas City school reveals penmanship of bygone days. » But handwriting ain’t going away quietly, and the debate over keyboard versus pen continues to rage.